LionsDeal > Catering & Buffet Supplies > Ice Displays and Beverage Housings >< Beverage Tubs > TableCraft BT21 Stainless Steel Beverage Tub, 20" x 12-1/4"
TableCraft BT21 Stainless Steel Beverage Tub, 20" x 12-1/4"
With the help of the Stainless Steel Beverage Tub, 20" x 12-1/4", you can chill and serve a variety of bottled or canned drinks. These hefty round beverage tubs have an impressive 11-gallon capacity, and they feature twin swinging handles for easy gripping and carrying. 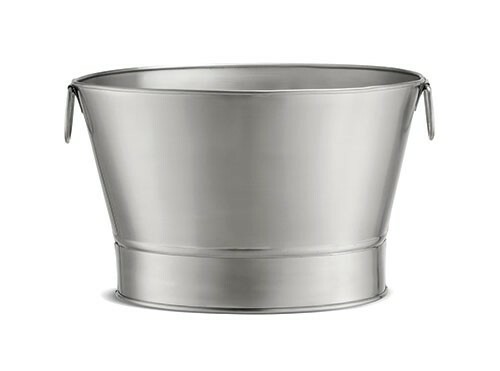 The durable stainless steel construction of these tubs makes them perfect for high-volume picnics, barbeques, outdoor wedding receptions and events.